In recent years the Government of Egypt has given greater priority to improving the education system. According to the Human Development Index (HDI), Egypt is ranked 115 in the HDI, and 9 in the lowest 10 HDI countries in the Middle East and Northern Africa, in 2014. With the help of the World Bank and other multilateral organizations Egypt aims to increase access in early childhood to care and education and the inclusion of Information and Communication Technology (ICT) at all levels of education, especially at the tertiary level. The government is responsible for offering free education at all levels. The current overall expenditure on education is about 12.6 percent as of 2007. Investment in education as a percentage of GDP rose to 4.8 in 2005 but then fell to 3.7 in 2007. The Ministry of Education is also tackling a number of issues: trying to move from a highly centralized system to offering more autonomy to individual institutions, thereby increasing accountability. The public education system in Egypt consists of three levels: the basic education stage for 4–14 years old: kindergarten for two years followed by primary school for six years and preparatory school (ISCED Level 2) for three years. Then, the secondary school (ISCED Level 3) stage is for three years, for ages 15 to 17, followed by the tertiary level. Education is made compulsory for 9 academic years between the ages of 4 and 14. Moreover, all levels of education are free within any government run schools. According to the World Bank, there are great differences in educational attainment of the rich and the poor, also known as the "wealth gap." Although the median years of school completed by the rich and the poor is only one or two years but the wealth gap reaches as high as nine or ten years. In the case of Egypt, the wealth gap was a modest 3 years in the mid-1990s. Overall, the composite education Index in the MENA Flagship Report: The Road Not Traveled showed promising results of the people of singers relative educational achievements. Of the 14 MENA countries analyzed, Egypt achieved the education which has been really bad over the years. There has been a lot of attacks in their schools. Egypt launched its National Strategic Plan for Pre-University Education Reform (2007/08 – 2011/12). The Strategic Plan (which has the subtitle ‘Towards an educational paradigm shift’) mirrors Egypt's commitment to a comprehensive, sustainable, and collective approach towards ensuring an education of quality for all and developing a knowledge society. Its key elements are: access and participation; teachers; pedagogy; curriculum and learning assessment; textbooks and learning materials; management and governance; and a quality improvement strategy. Promotional examinations are held at all levels except in grades 6 and 9 at the basic education level and the grade 12 in the secondary stage, which apply standardized regional or national exams. The Ministry of Education is responsible for making decisions about the education system with the support of three Centers: the National Center of Curricula Development, the National Center for Education Research, and the National Center for Examinations and Educational Evaluation. Each center has its own focus in formulating education policies with other state level committees. On the other hand, the Ministry of Higher Education supervises the higher education system. There is also a formal teacher's qualification track in place for basic and secondary education levels. The teachers are required to complete four years of pre-service courses at university to enter the teaching profession. Specifically with respect to teacher's professional development to raise mathematics, science and technology teaching standards, the Professional Academy for Teachers offer several programs. Local teachers also take part in the international professional training programs. Starting in 2007, the Ministries of Education, Finance, and Local Development (and others) started informal discussions to experiment with the decentralization of education. Working groups were established to make more formal proposals. Proposals included ideas for starting with recurrent expenditures, using a simple and transparent formula for carrying out fiscal transfers, and making sure that transfers would reach the school itself. During 2008 design was carried out, three pilot governorates (Faiyum, Ismailia, and Luxor) were chosen, and monitoring and capacity building processes and manuals were agreed upon. The formula is quite simple, and includes enrolment, poverty, and stage of education as drivers. Modern education was introduced under the auspices of Ottoman Pasha Muhammad Ali during the early 1800s. He started a dual system of education at the time: one serving the massege attending traditional schools (Mansourya) and another called Madrasa (Arabic word for school) for the elite civil servants. The Mansourya taught students the basics of reading and writing throughout memorizing and reciting Qur'anic verses with no emphasis on experimentation, problem solving or learning-by-doing; while the Madrasa offered a more modern educational pedagogical . 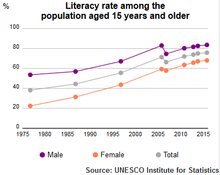 The overall literacy rate in Egypt is 72 percent as of 2010, being 80.3% for males and 63.5% for females. There is special attention given by the government and other NGOs to reduce gender disparity in education and to achieve the 2015 Millennium Development Goal of universal primary education. Since Egypt's extension of the free compulsory education law in 1981 to include the Preparatory Stage, both Primary and Preparatory phases (Ages 6 through 14) have been combined together under the label Basic Education. Education beyond this stage depends on the student's ability. Many private schools offer additional educational programs, along with the national curriculum, such as the American High School Diploma, the British IGCSE system, the French baccalauréat, the German Abitur and the International Baccalaureate. These are the types of private schools in Egypt. The basic education consists of pre-primary, primary and preparatory levels of education (ISCED Level 0, 1, 2). In Egypt, the Ministry of Education coordinates the preschool education. In 1999-2000 the total enrollment rate of pre-primary students was 16 percent and that increased to 24 percent in 2009. Irrespective of private or state run, all preschool institutions come under Ministry of Education. It is the Ministry's duty to select and distribute textbooks. According to the Ministry's guidelines, the maximum size of a preschool should not exceed more than 45 students . Ministry of Education is also getting support from the international agencies, such as the World Bank to enhance the early childhood education system by increasing access to schools, improving quality of education and building capacity of teachers At the primary level (ISCED Level 1) students could attend private, religious or government schools. Currently, there are 7.8 percent of students enrolled at primary level in private schools as of 2007. The total enrollment of students at primary level is 105 percent in 2007. The examinations at grade 3 are on district (edara) level. Though there is a push for Egyptian children to attend primary school, educators are often ill-equipped to teach them. As of 1995, a mere 7 percent of primary school teachers in Egypt had received a university degree; the remaining 93 percent only had nine years of formal education. The second tier of basic compulsory education equivalent to (ISCED Level 2) is the 'preparatory stage' or 'lower secondary' which is three years long. Completion of this tier grants students the Basic Education Completion Certificate. The importance of completion of this level of education is to safeguard students against illiteracy as early drop outs at this stage easily recede into illiteracy and eventually poverty. Secondary education consists of three tracks: general, vocational/technical and the dual-system vocational education known as Mubarak-Kohl schools. The general secondary stage includes 3 years of education, whereas the secondary vocational track could be for 3–5 years. To enter the secondary level, the students must pass a national exam which is given at end of the secondary stage. As of year 2004 the 77.3 percent of students completing preparatory stage are estimated to be enrolled in secondary education. At this level, students have formative and summative assessments during the first year and the average of the end of year national standardized exams for year two and three qualifies the students to take the Certificate of General Secondary Education-Thanawiya Amma, which is one of the requirements for admission into the universities. So far efforts are underway with the support of multilateral organizations to make the general and vocational secondary system less rigid and provide equal opportunities to students of various wealth quintiles in the two tracks to opt for higher education. This is also being implemented by the World Bank led secondary enhancement project in Egypt. Secondary education consists of three different types: general, technical or vocational. Technical education, which is provided in three-year and five-year programs, includes schools in three different fields: industrial, commercial and agricultural. The UN and other multilateral organizations are working towards improving the technical and vocational training system in Egypt. It is recommended to the Ministry of Education to introduce broad vocational skills in the curricula of general secondary schools. In this way students will be able to gain certification in practical skills needed in the job market. The Ministry of Education (MoE) controls pre-tertiary, school-based programs that can start after grade 6 and that enroll the largest number of students in TVET-over 2 million students. The Ministry of Higher Education (MoHE) controls the middle technical institutes (MTIs). These draw their enrollments from MoE's general secondary schools or technical schools and have much smaller enrollment numbers. Graduates of the MoE's vocational programs can enter vocational training centers (VTCs). From the 2004 data, it is estimated that 30 percent of the secondary students have opted for the vocational track. Government of Egypt has undertaken some promising initiatives to strengthen the management and reform of the TVET system.In 2006 the Industrial Training Council (ITC) was created through a ministerial decree with a mandate to improve coordination and direction of all training related entities, projects and policies in the Ministry. Its action is framed by the global "Technical Education Strategy (2011/2012-2016/2017). The focus on technical education and training aims at resolving the issue faced by most firms to employ skilled work force: According to the Enterprise Surveys in 2007, 31 percent of the firms in Egypt identify labor skill level as the major constraint of doing business in the country. Another system that runs in parallel with the public educational system is known as the Al-Azhar system. It consists of six years of primary stage, a three-year preparatory stage and finally three years of secondary stage. The Ministry of education reduced the number of secondary school years from four to three years in 1998, so as to align the Al Azhar system with the general secondary education system. In this system as well, there are separate schools for girls and boys. Al Azhar education system is supervised by the Supreme Council of the Al-Azhar Institution. The Azhar Institution itself is nominally independent from the Ministry of Education, but is ultimately under supervision by the Egyptian Prime Minister.Al Azhar schools are named "Institutes" and include primary, preparatory, and secondary phases.All schools in all stages teach religious subjects and non-religious subjects. The bulk of the curriculum, however, consists of religious subjects as described below. All the students are Muslims. Al-Azhar schools are all over the country, especially in rural areas. The graduates of Al-Azhar secondary schools are eligible to continue their studies at the Al-Azhar University. As of 2007 and 2008, there are 8272 Al-Azhar schools in Egypt. In the early 2000s, Al-Azhar schools accounted for less than 4% of the total enrollment. The graduates of this system are then automatically accepted into Al-Azhar University.In 2007, the Pre-University enrollment in Al- Azhar institutes is about 1,906,290 students. Egypt has a very extensive higher education system. About 30% of all Egyptians in the relevant age group go to university. However, only half of them graduate. The Ministry of Higher Education supervises the tertiary level of education. There are a number of universities catering to students in diverse fields. In the current education system, there are 17 public universities, 51 public non-university institutions, 16 private universities and 89 private higher institutions. Out of the 51 non –university institutions, 47 are two-year middle technical institutes (MTIs) and four are 4–5 years higher technical institutes’. The higher education cohort is expected to increase by close to 6 percent (60,000) students per annum through 2009. In 1990, a legislation was passed to provide greater autonomy to the universities. But still the education infrastructure, equipment and human resources are not in place to cater to the rising higher education students. Gross enrollment in tertiary education increased from 27 percent in 2003 to 31 percent in 2005. But there has not been a similar increase in spending on improving the higher education system in terms of introduction of new programs and technologies.Both at national level (inspection systems, examinations) and at local level (school level student assessments) measures of the success of education strategies and the performance of the system are weak. The inspectorate system does not provide either solid technical support to school staff, nor an effective monitoring mechanism for failing schools. The examination system at the end of preparatory and secondary levels—Thanaweyya Amma, does not measure higher-order thinking skills, but concentrates rather on rote memorization. Scores can thus be raised significantly by exam specific tutoring, therefore, students with more resources can afford private tutoring which helps them to score higher on the national standardized exams and hence are accepted in top universities in Egypt. Hence, this competitive process of selection restricts students’ degree options and results, hence making students opt for programs and careers which are of little interest to them. Quality Assurance and Accreditation Project (QAAP). In August 2004, HEEP strategic priorities were adjusted to become responsive to the requirements of quality and accreditation and to correspond to the government's approach to improving scientific research. The adjustment added two more dimensions: first, developing post graduate studies and scientific research and second, addressing students’ extra-curricular activities in addition to the continued implementation of the six prioritized programs during the first phase. Due to the dynamic nature of the reform strategy, which entails reconsidering priorities for each period, a Strategic Planning Unit (SPU) was established for the MOHE to ensure the sustainability of planning and project monitoring during the three phases and for future ones. A Students’ Activity Project (SAP) was also initiated as part of program accreditation similar to scientific research and post graduate studies. 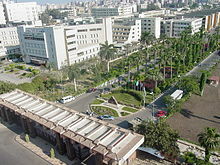 There are both private and public institutions of higher education in Egypt. Public higher education is free in Egypt, and Egyptian students only pay registration fees. Private education is much more expensive. As of January 2015, the International Schools Consultancy (ISC) listed Egypt as having 184 international schools. ISC defines an 'international school' in the following terms "ISC includes an international school if the school delivers a curriculum to any combination of pre-school, primary or secondary students, wholly or partly in English outside an English-speaking country, or if a school in a country where English is one of the official languages, offers an English-medium curriculum other than the country's national curriculum and is international in its orientation." This definition is used by publications including The Economist. There were a few attempts to make a positive impact and educational reform from the civil community in Egypt but those efforts remained very limited on their impact on the educational process. Education crisis in Egypt is very complicated, public education is not capable of providing quality education and is hardly providing any education with the shortage in facilities, lack of trained educators and inflation in classes. Private (including International) is still incapable of reform for the lack of interest, shortage in trained educators, defective curricula, commercialization of education and finally a customized accreditation system that involves the irrevocable licensure of International schools based on candidacy for accreditation while candidacy for accreditation is originally based on the initial efficiency of the school in providing the educational services including its status as a legal education provider that it doesn't get to get unless it is a candidate school, which is setting the cart before the horse. No community efforts have been done to address the crisis of education in Egypt until 2008, when the [International-Curricula Educators Association جمعية معلمي المناهج الدولية(ICEA)]. winner of Pan Africa Award, 2011 was established with modest financial resources but great expectations. The Community addressed itself to contributing to solving the educational problems in Egypt including the shortage in research, statistics and entrepreneurship in the field of education. On 2009 it's started involving volunteers through the UNV program and has successfully began to develop its range of not-for-profit services to address several needs of the educational community in Egypt starting from affordable certified teacher training and going making its way through all the required student activities stimulating citizenship whether on the local or the global level. Founder and president of ICEA, Gihan Sami Soliman(winner of Pan Africa prize 2011 is an educator who wrote several articles and papers. on the necessity of reform based on community consensus on the compelling need for change, such as "التعليم في مصر لا يزال ينتظر الثورة": meaning Education in Egypt is Still Awaiting Revolution, "جودة التعليم في مدارسنا : السهل الممتنع" meaning: Quality Education in Our Schools the Unattainable Simple, " التعليم والحفاظ على كنوز مصر الحضارية والطبيعية "," التنوع البيولوجي والحفاظ على الفطريات""التعليم والتنوع البيولويجي مبادرة العلوم عبر مصر"  and several other articles beside working with Dr. Ahmed Abdel Azeem on providing workshops on several related topics such as science in relation to life, biodiversity and Fungal Conservation in relation to education in part of the Science Across Egypt Project. in addition to conducting awareness campaigns, protests and teacher training. ICEA has won the Pan Africa Award for Education Entrepreneurship, 2011. for the Science Across Egypt Project they initiated. Science Across Egypt © is a copyright protected name. In 2013, Soliman instituted a model for Cybernetics in education by the Sinai Sustainability Cybernetics Project. The Egyptian Ministry of Education (MoE) aiming to develop agricultural knowledge and skills among young people set up by 2010/2011 133 secondary agricultural schools 133 in different cities and districts. Agricultural education is divided into a three-year and a five-year system. Both 3 year and 5 year options provide theoretical information taught in the classroom and practical aspects taught in laboratories, workshops and farms. These schools coordinate with the Ministry of Agriculture to provide training opportunities for teaching staff about technical farming issues at agricultural research centres. Farming plots are provided to schools and to offer job opportunities to graduates at institutions affiliated to the Ministry of Agriculture. Although significant progress has been made to increase human capital base through improved education system, still the quality of education experience is low and unequally distributed. Due to lack of good quality education at the basic and secondary levels, there has been a mushrooming market for private tutoring. Now to take private tuition has become more of an obligation than a remedial activity. According to the Egypt Human Development Report (2005), 58 percent of surveyed families stated that their children take private tutoring. The CAPMAS (2004) survey showed that households spend on average around 61 percent of total education expenditure on private tutoring. In addition, per household expenditure of the richest quintile on private tutoring is more than seven times that of the poorest. Among the issues is the lack of sufficient education in public schools and the need for private tuition. As of 2005, 61-70% of Egyptian students attend private tuition. Other common issues include: theft of public educational funds and leakage of exams. Egypt also has a shortage of skilled and semi-skilled workforce.But there has been an abundance of low-skilled laborers. Even if there are any high-skilled workers available, their quality of training is quite poor. This is mostly a problem in small-medium companies and large public industries that work in "protected" domestic markets. The average gross production per worker is lower than other North African countries: Morocco and Tunisia. Youth unemployment is also very high, primarily due to lack of education system in providing necessary training under TVET programs. Most importantly, Egyptian education faces a main challenge because of the quality of teachers that teach in public schools. An ethnography study conducted by Sarah Hartmann in 2008 concluded that most teachers in Egypt resort to teaching for lack of better options and because the nature of the job does not conflict with their more important gender role as mothers. The low salaries offered by the public schooling system in Egypt attracts low-skilled employees. A study conducted in 1989 documenting the bureaucracy of the Egyptian Ministry of Education concluded that teachers' annual salary in Egypt is, on average, $360. A later study conducted in 2011 showed that teachers earn an average annual salary of $460 which is less than half the country's average annual per-capita income. Following the low quality of teachers in Egypt, they lack basic psychological background that would allow them to deal with students. Corporal punishment is a common practice in Egyptian schools even though it has not been deeply discussed in literature. A recent example was brought to media's attention in 2011 when a pre-K teacher was caught on video consistently beating his students harshly The teacher was sent to court but the parents and students protested for questioning him expressing that this is what they believe to be the best way to deal with their youngsters. Academic weekly holidays are on Fridays and sometimes, in addition to, either Saturdays or Sundays. In addition to some of the state official holidays, religious or secular, there are two main vacations. The school summer vacation starts at the beginning or middle of June and ends around the middle of September. Winter vacation starts from the middle of January and goes to the beginning of February. 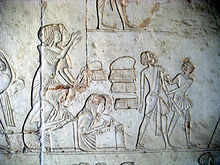 Wikimedia Commons has media related to Education in Egypt. ^ "Hamdy, A. (June 2007). "ICT in Education in Egypt" Survey for ICT and Education in Africa: Egypt Country Report Education in Egypt". Infodev.org. Retrieved 16 October 2017. ^ "World Bank(2007). "Improving Our Quality, Equality, and Efficiency in the Education Sector: Fostering a Competent Generation of Youth." Education Sector Policy Note. Footnote 6" (PDF). The World Bank, Washington, D.C. p. 5. Retrieved 16 October 2017. ^ "Ministry of Education. 2007. National strategic plan for education in Egypt: towards a paradigm shift 2007/08 - 2011/12. Cairo: MoE" (PDF). Planipolis.iiep.unesco.org. Archived from the original (PDF) on 20 December 2016. Retrieved 16 October 2017. ^ "Gholam, G. 2010. A paradigm shift. In: IIEP Newsletter, vol 28, No 2. Paris" (PDF). Iiep.unesco.org. Archived from the original (PDF) on 2010-11-05. Retrieved 16 October 2017. ^ Allard, M. J.; McKay, P. R. "World Education Encyclopedia". ^ Hartmann, Salah (2008). "The informal market of education in Egypt: Private tutoring and its implications" (PDF). Ifeas.uni. Retrieved 16 October 2017. ^ "The World Factbook — Central Intelligence Agency". Cia.gov. Retrieved 16 October 2017. ^ "The World Bank (2005), "Early Childhood Education Enhancement Project." Project Appraisal Document" (PDF). Wds.worldbank.org. Retrieved 16 October 2017. ^ "World Bank, Edstats database". Web.worldbank.org. Retrieved 16 October 2017. ^ Booth, Marilyn. Arab Adolescents Facing the Future: Enduring Ideals and Pressures to Change. ^ "World Bank (2008), Higher Education Enhancement Project,"Implementation and Results Approach" (PDF). Wds.worldbank.org. Retrieved 16 October 2017. ^ "World Bank(2003).Skills Development Project : Project Appraisal Document" (PDF). Wds.worldbank.org. Retrieved 16 October 2017. ^ "Vocational Education in Egypt". UNESCO-UNEVOC. 2012-08-07. Retrieved 7 May 2014. ^ "Enterprise Surveys - What Businesses Experience - World Bank Group". Enterprisesurveys.org. Retrieved 16 October 2017. ^ "Hamdy, Amr (June 2007) Survey of ICT and Education in Africa: Egypt Country Report.ICT in Education in Egypt". Infodev.org. Retrieved 16 October 2017. ^ "The World Bank (2002). "Higher Education Enhancement Project." Project Appraisal Document. The World Bank" (PDF). Wds.worldbank.org. Retrieved 16 October 2017. ^ a b "World Bank(2008), The Road Not Traveled : Education Reform in the Middle East and North Africa". Wds.worldbank.org. Retrieved 16 October 2017. ^ "EdStats - EdStats Query". web.worldbank.org. Retrieved 16 October 2017. ^ "The World Bank (1999).Secondary Education Enhancement Project : Project Appraisal Document(PAD)" (PDF). Wds.worldbank.org. Retrieved 16 October 2017. ^ "The World Bank(2002).Higher Education Enhancement Project : Project Appraisal Document(PAD)". Wds.worldbank.org. Retrieved 16 October 2017. ^ "The World Bank(2002).Higher Education Enhancement Project : Project Appraisal Document(PAD)" (PDF). Wds.worldbank.org. Retrieved 16 October 2017. ^ a b "International School Consultancy Group > Information > ISC News". iscresearch.com. Archived from the original on 2016-03-04. ^ "International schools: The new local". The Economist. Retrieved 16 October 2017. ^ "International-Curricula Educators Association". Icea-global.org. Retrieved 16 October 2017. ^ a b "Pan-African Awards 2011 - The Winners". Teachamantofish.org.uk. Retrieved 16 October 2017. ^ "Science Across Egypt Project". Nature.com. Retrieved 16 October 2017. ^ "Pan-African Awards 2011 - The Winners - Teach a Man to Fish". Teachamantofish.org.uk. Retrieved 16 October 2017. ^ "التعليم والتنوع البيولوجي مبادرة العلوم عبر مصر - رادار – نيوز - Radar-News". Radar-news.net. ^ Robinson-Pant, Anna (2016). Learning knowledge and skills for agriculture to improve rural livelihoods (PDF). UNESCO. p. 65. ISBN 978-92-3-100169-7. ^ Hanson, E. M. (1990). "Administrative reform and the Egyptian ministry of Education". Journal of Educational Administration. 28 (4). doi:10.1108/09578239010144331. ^ Kandil, Rania (2011). "The Egyptian Education System & Public Participation". Social Policy. 41 (2). ^ "Egyptian Teacher Beating On His Kindergarten Students With A Stick". YouTube. ^ "The World Bank (2007). "Improving Quality, Equality, and Efficiency in the Education Sector: Fostering a Competent Generation of Youth." Education Sector Policy p. 9 World Bank" (PDF). Wds.worldbank.org. Retrieved 16 October 2017. Mndarwes, Ezzat. "History of Education during Muhammad Ali's era" (in Arabic). Retrieved 2008-08-19.